Sunbathing is taken for granted and Benidorm has some of the best and biggest beaches in Europe. However, for people who want more to do, somewhere for the kids, a diversion from the sun, there’s plenty to do in Benidorm. TotalBenidorm.com runs an attraction visitor service. We’ll pick up to 4 people up, take you to the attraction and supply the tickets at the cost advertised by the attraction. When you’re finished, just text us and we’ll pick you up. Hassle free service and simple. Pick up is 10 Euro. Just press the button below and contact us. For larger groups just give us a little more notice and we will arrange suitable transportation. Whilst Poniente Beach nearer the Old Town is quite busy, the majority of Poniente Beach is much quieter. Poniente Beach has far more apartments and villas, hardly any high rise hotels apart from those very near the Old Town. There are lots of Spanish visitors who travel down from Madrid and other big cities, often in large family groups. They tend to bring their own beach ‘stuff’ like beds and small chairs. At the weekends in Summer the beach is busier as it attracts locals and people from nearby towns. Whilst there are sun bed areas, Poniente has far more open spaces and a much more relaxed atmosphere. Each night the Lavante, Poniente and Mal Pas beaches are cleaned and raked ensuring each new day starts afresh. This is all paid for from the revenue generated from sun bed hire – about 4.5 Euros per bed, the same for an umbrella. Levante Beach in Benidorm is the busiest. The middle part of the beach is popular with British who walk down from the big Benidorm hotels just above. The far end attracts Spanish whilst the part of Levante Beach nearer the Old Town has a mixture of all types of visitors. A small cove at the base of Benidorm Old Town, this has no sun beds but affords a more sheltered spot – great for shielding from the wind in off-season months. Quite hard to get to other than by car but close to Benidorm, this nudist beach attracts those who like the sun all over. Raco del Conill is also popular with Gay travellers. A beach not so suited to young families but proof that Benidorm really is for everyone. Click here for a map and directions to Raco del Conill. Great waterpark. Water is sourced direct from the sea so it will be salty. Has a lot of very good rides and is perfect for families or groups of friends. Might be a good idea to go in the afternoon as it tends to be less busy (in my experience). Half day pass is really all you need. grab a local paper or look out for coupons and leaflets – often have discounts. Not sure you can book online. The food there is OK but basic. Personally I wouldn’t bother taking anything to eat as storage can be a headache. The lockers are sufficient and you’d be recommended to store valuables in there as thieves can operate there. You’ll be singing this all day long once you watch it. Gives a great idea of what you will find in Aqualandia in Benidorm. Newer than Aqualandia so may appear a little more modern. Not as many rides though. Has the advantage of having some shows and ‘joining in activities’. Watch the video, it will give you some idea. The water park is part of Terra Natura, the animal park (see this page) and you can get combined tickets. Again, often found on promotion and money off coupons. Ok, it might not be in your language but the pictures of Aqua Natura gives a good idea of the waterpark in Benidorm. Terra Natura in Benidorm is a really nice Zoo which is larger than a lot of Spanish Zoos which tend to be quite small. The size of the park means the enclosures are natural and themed. There are four parts to Terra Natura in Benidorm with animals from America, Europe and Asia. The fourth part of the zoo is reserved for poisonous creatures. The cost will be about 20 to 30 Euros and tickets can be bought online. Good video by the tourist board of Benidorm showing the park. You’ll get to see the sorts of animals too. Notice the heat. Opening times are from 10/10.30 depending on the time of the year but closing times can stretch up to 8 in summer. I’d go first thing to escape the heat and then to the water park or beach next. Either that or go later. MundoMar in Benidorm has penguins, dolphins, sea-lines as well as land based animals such as meerkats are featured in this long established marine/animal park. Prices range from the about 20 Euros per person but there are a range of ticket combinations including family tickets. MundoMar, roughly translated means the world of the sea, also features ‘Experiences’ where you can be a keeper for the day at about 60 Euros, right up to swimming with dolphins at 150 Euros. Might not appeal to all given the bad press some of these types of parks have received lately in the USA. The park is near Aqualandia and is part of the same group. Terra Mitica in Benidorm is a ‘fun fair’ with some great rides and entertainment. The park has a number of themed areas, those of us who have been to the likes of Disney World etc will be familia with the idea. The areas or ‘worlds’ are; Egypt Asia, Iberia and Rome. There is a large Children’s area which the young will like and it could be said Terra Mitica does this better than Disney. The park is quite large and it will take quite a few hours to explore every part. Whilst the park opens early, it might be a good idea to go early evening to beat the heat. Prices are about 35 Euros online, higher if you arrive at the gate. There are concessions for children and groups. This video is probably worth looking at to give you a real idea of what to expect at Terra Mitica in Benidorm. The video dates back to 2013 but not much has changed. Notice a lot of the shots are in the evening and the shows seem to take place later in the day. The park has some covered areas and the Lilly pink skins of Northern Europeans could suffer in the full glare of the midday sun. WARNING: Terra Mitica only opens in the summer months. The park literally closes for many months of the year. Terra Mitica is open June to August and at the tail end of September / start of October. 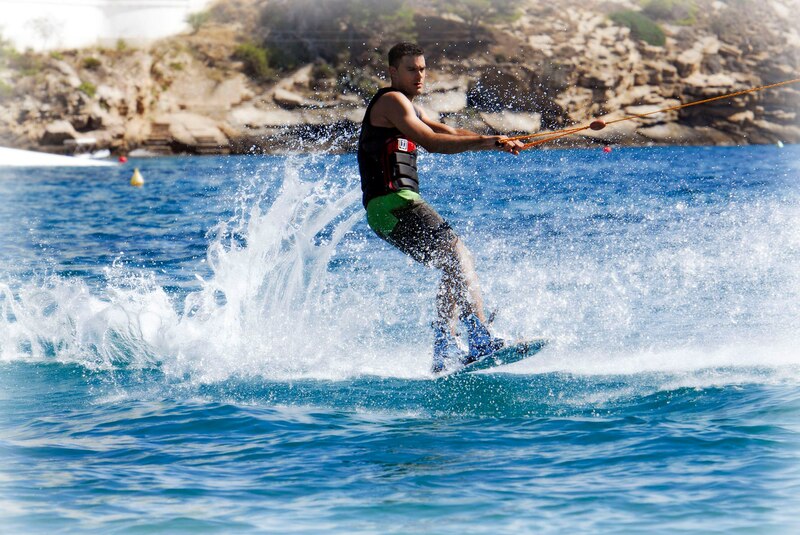 Much of the hassle and cost of water skiing is taken out by this system which basically drags skiers around a very large circuit by cable around a course of about 1,000 square meters in perimeter. Of course, you have to be able to swim to try out waterskiing. However, the company running this popular activity offer a massive range of courses tailored to the novice and skiers with a little experience. The cost is about 2o Euros per hour but you’ll probably have to hire some equipment so costs per hour can be 30+ Euros fully loaded. The activity is popular and will need to be booked. Its great fun but can challenge those with big bellies and weak legs! You’ll find plenty of commercial enterprises along the beach and in the tourist areas offering jet ski packages, scuba diving courses, paragliding and, of course, pedelow boats. A good tip is to get there early in the busy months if you don’t fancy booking. Also, have in mind hotels and holiday reps get commission from the companies running water based activities so you’re often better to approach a member of staff to get the best price. Don’t forget, it isn’t rude to negotiate! The great thing about golf holidays in Benidorm is that you can play in the day and play at whatever you want in the night. We’ve listed the Golf Courses in Benidorm below but there are more slightly up the coast in the next resorts of Albir and Altir. Benidorm isn’t just about doing, drinking and eating, there’s real beauty too.